The past couple weeks we've been redoing Harry's room. Nothing major, but we gave him more space and made it more age appropriate. On Saturday the boys were out at Ant's fantasy football draft so I finished up the room and took some pictures. If you're interested, here's how Harry's nursery looked when he was about 2 months old. Here's what the new room looks like now. 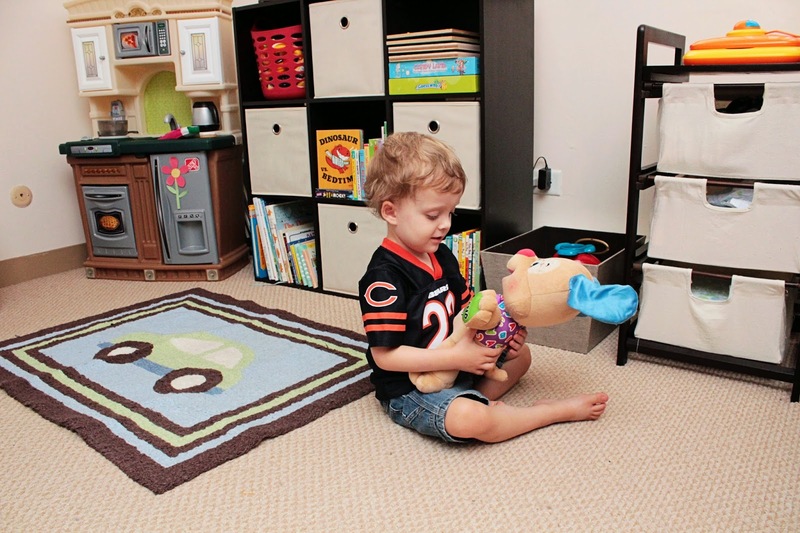 The two biggest changes were getting rid of the changing table and craft table. Harry was too big for the changing table to be safe anymore (he had a habit of jumping on it) and I'd been feeling guilty about having so much of my stuff take up his room. I loved playing in my room growing up and before he really didn't have much space to do that. My craft table is now tucked away in the closet along with most of my crafting supplies. Those pink drawers are mine, and there's some paper storage behind the rocker. The only new piece of furniture is the cube organizer. I love how it works as a bookshelf and toy box all in one. The toddler bed still works for now, but I think we'll want to talk about getting him a larger bed next summer-ish. When we first got his dresser I was worried it would be too small, but between that and his closet, we haven't had a clothing storage issue. More shots of the room. The boys got home while I was taking pictures of the room. Those were also my puzzles as a kid. I love that Harry can now play with them. I'm happy with how everything turned out, and most importantly, Harry likes it, too. He has spent a lot of time in there already. He loves that he can "wash his hand" in his little kitchen before, during, and after every diaper change. He has this adorable little routine (the cabinet handle is the soap dispenser and he moves the stove knobs to dry his hands off) and when he's done he screams, "I'm allllll clean!" I'd love to completely redo the room, but am trying to hold off until we gets a new bed so I'm not buying toddler-sized sheets he'll only use for a short time. I love all the bright, bold colors of the toys I have displayed, so I think that's kind of the direction I'll take when redecorating. I had the same duck as a kid. Do you happen to know who made it? Oh, how fun! It was one of my favorites growing up. The tag says "GUND" on it! !